PART CIRCLE FOR END OF SYSTEM COVERAGE. 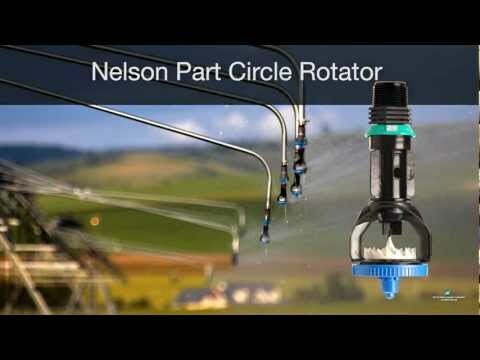 Gain additional end-of-system acreage at low pressure. Complement traditional end gun packages to fill the pattern going in and out of corners. The Part Circle Rotator® is available with 3 different plate options - choose based on nozzle size. Click here for performance data.The Part Circle Rotator distributes water to one side in an approximate semicircle. It can be used to minimize application on pivot towers or other structures. Choose from the 3000 Series or new 3030 Series with 3NV Nozzle. Part Circle Rotators can now be used on “boombacks” with IACO’s hose boom - www.boombacks.com. THROW RADIUS = 27' (8.2 M) AT 20 PSI (1.4 BAR) WITH #36 NOZZLE. The Pivot Rotator provides high uniformity and the widest throw on drops.